Eating together as a family creates a bond of togetherness that carries over into other aspects of our lives. It creates a strong base for more productivity in the workplace. Achieving an optimum work-life balance is very important for both employees and employers, and it is essential to productivity in the workplace. Being able to manage your time in such a way that you have time for your family and time to work is crucial to your productivity in the workplace and to the family. Most individuals are able to please their workmates and their boss, but their families miss them most of the time and wish they could spend just an hour with them. Family is important, fun and very fulfilling in anyone’s life. However, the question is how do you create that time to spend with your family, considering you have all tight schedules that are always filled? 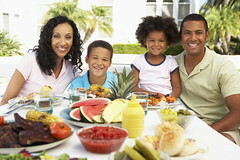 Eating together as a family creates a unique platform that allows the family as a whole to open up about themselves and lets you learn about each other. Eating together lets you catch up on the days’ events or just talk in general. Insignificant as it may seem, talking builds your bond as a family, talk by talk. As a busy person in life, you should never forget that all the work you do and all the productivity in the workplace that you carry out, is so that your family can have a better life. A work-life balance allows you to create and meet the emotional social needs of your family and this is the secret to being happy in life. For more information on Andy’s programs Sign Up for Andy's eZine!